Well, a very calm start to my adventure in discus keeping continues. The pigeon bloods are growing at an incredible pace. 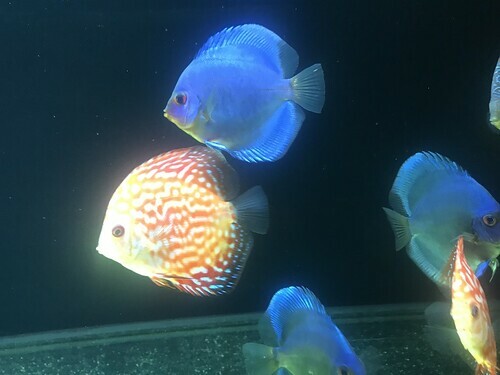 They started as the smallest discus purchased, some being the 6.5cm size as advertised but a couple certainly being a little smaller ( all this being understood as they would all be from the one spawn so veneration can be expected I suppose ), these fish have grown incredibly fast compared to the rest. 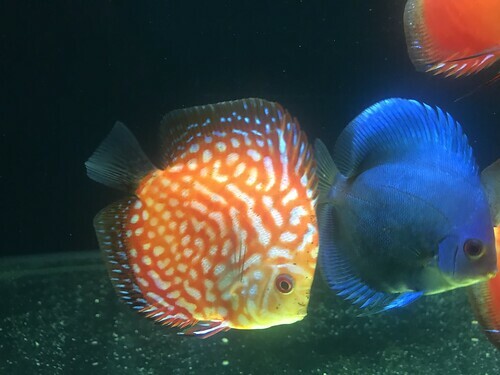 One of them is now as of today the largest fish in the aquarium despite 6 weeks ago the Leopard snakeskins and solid fire reds being sold as 8 cm fish. I got to pick the largest of these so they were starting at 8cm and getting bigger. The blue diamonds Leopard snakeskins and the solid fire reds are slowly and almost imperceptibly growing but still going in the right direction. Here's the latest video of the full pack, watch at the start of the video when they spot me coming with the food how they charge over to see can they be first to it. Coming towards the middle to the end of the video i do a little zoom to try to show some of the fish individually. Fire reds look amazing Mick. You've got it goin on fo'sho mate!! You are going great guns, just shows how going about discus-keeping in a ----- (insert as appropriate: informed, focussed, single-minded, obsessive, etc) manner pays dividends! I love the solid fire reds potential. I find it perturbing they are not bloody solid red yet hehehe. Anybody any experience how long it takes for these to fully colour up or is it a hit and miss affair. 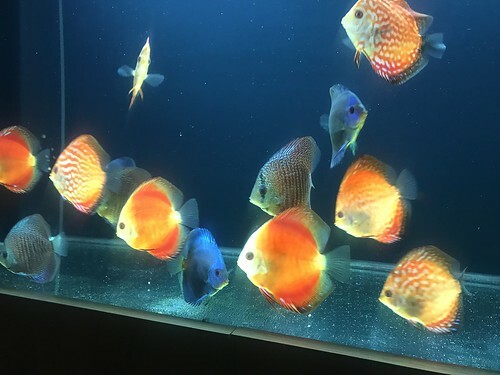 All photos I see of them fully coloured up are of adult fish so I suppose I could be waiting for the best part of a year to see that colour transformation complete. Paul thank you for the kind words. I've really worked hard at the project so far and am really enjoying the results. A compliment from yourself means loads to me ! Its been an interesting and slightly less quiet week this past week. After the big sump clean I decided it would be worthwhile to keep an eye on the parameters of the water just in case i over did it on the cleaning and disturbed the bacteria. This turned out to be the correct decision. At this point my poor fish went on a 2 day starvation diet, apart from a few pellets but beefheart was a no no for the few days. I didn't notice any particular change in the behavior of the fish before I tested the water, but since the ammonia results being unacceptably high I observed them more closely and thinking back over the previous days I do remember the fish being much more skittish and prone to darting across the aquarium into the walls at somebody other than me even standing beside the tank. This has all since returned to normal. 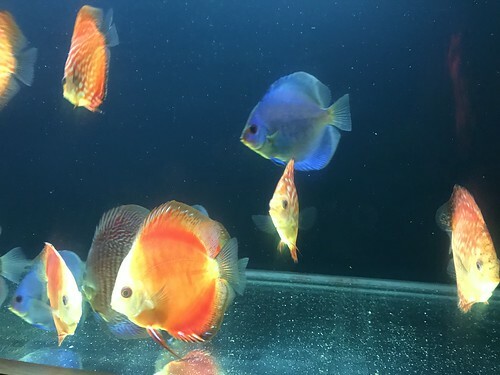 I suppose the ammonia triggered the danger fight or flight response in the fish and lets face it discus don't hang around waiting for the fight hehe. The fish seem to be none the worse for wear for their stressful week although I don't see much growth in them this week. Last edited by MickO'S; 01-20-2019 at 07:41 AM. Good catch Micko. You’re doing a great job on these. They look amazing! After the high ammonia of two weeks ago I paused my feeding for two days, the api test read normal (ie deep yellow). I was feeding 4 times a day, pellets in the morning with 1 stendker beef heart cube 3 times a day. 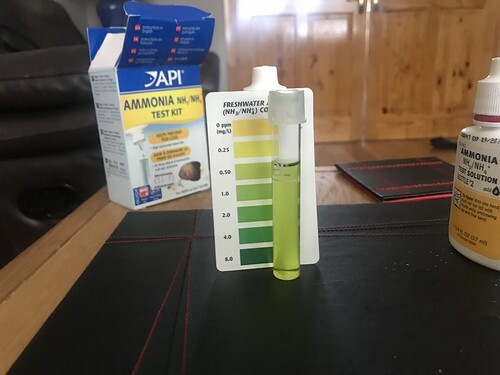 This was obviously to much for my system to cope with and this showed up as ammonia that maxed out at .5ppm one evening. As I said I paused feeding and when this happened. When I restarted feeding I still chose to feed 4 times a day but reduce beef heart from three blisters to two. 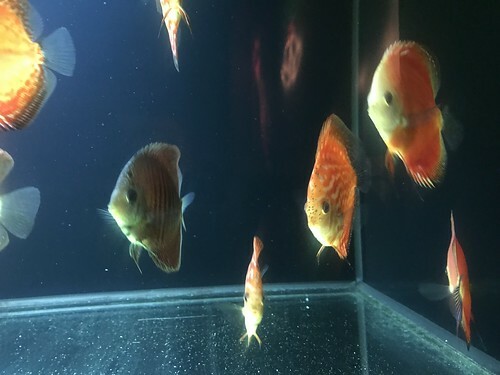 I did all the responsible things that I should, I cleaned the poop off the the bottom with my siphon 2 or 3 times a day, daily scrubbing of the bottom of the aquarium and biweekly cleaning of all the rest of the glass. So before every feed I did a quick ammonia test and in the correct light I could see the yellow colour I was looking for. As always I continued to obsessively watch my fish (except when eating but I'll get back to that later) I did notice some at first some small changes. 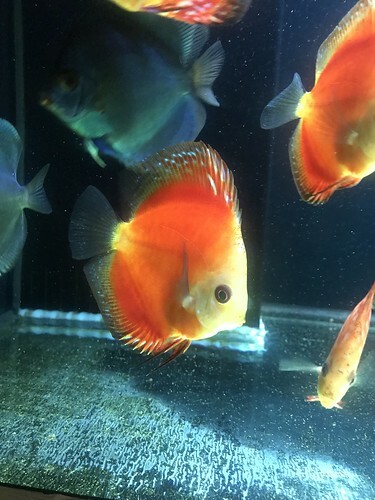 It started with a blue diamond with a scale or two missing, I've seen that before with cichlids though so not to concerned. Then I noticed on another BD with what looked like a scrape on its side. My aquarium is totally devoid of any decoration and all it could possibly be was if it rubbed off the outflow pipe of the return pump that directs water into the tank. It looked as if it could possibly be that size and shape so unhappily i said it must be that in the absence of all other possibilities I could think of. 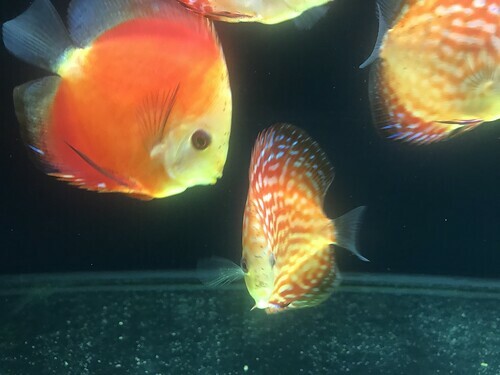 Over the next few days maybe 8 or so this appeared on other BDs, these are the most pugnacious of the discus so I allowed myself to put it down to this. 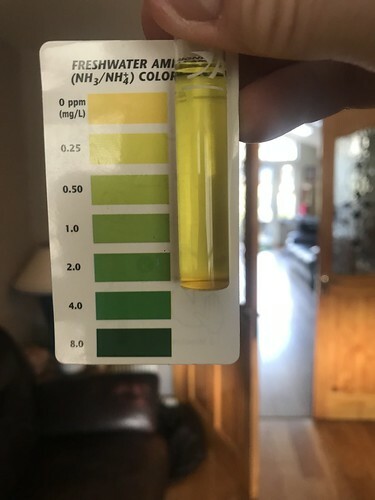 All this time I continued to check for ammonia, every time I annoyed my wife and son to confirm that the colour was in fact yellow as I wanted it to be. Most of the time they were sort of in agreement that it was nearly yellow and if it went to green I'd skip that feed. 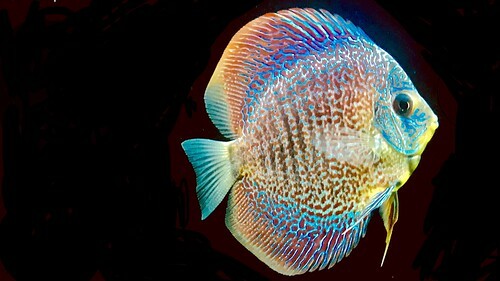 The next change was a small bacterial nodule (pimples) on the very end of its ventral fin. This is definitely something I couldn't put down to an injury !! 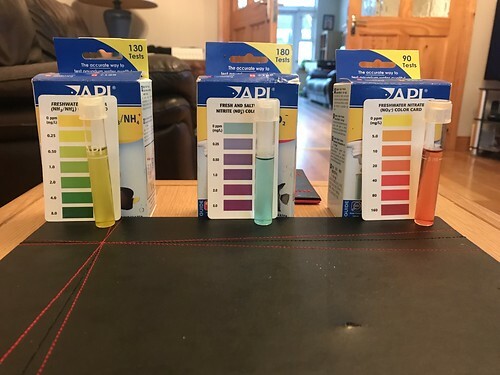 I continued to do water tests up to 4 times daily and nitrite and nitrate were well within what i consider satisfactory ie 0ppm nitrite and less than 10ppm nitrate (I understand this is not ideal but is the trade-off for my automated system that I understood starting this journey) .I want to get across in this post that all this on one page in one post sets off major alarm bells but only occasional issues that resolved themselves over a couple of days while fish were eating well put me to attention but not hyper in my worry, so the bacterial nodules started appearing on two other fish, another BD and a solid fire red. Two of my Solid Fire Reds did the Blair Witch corner stare, anybody about my age will know remember the movie of the same name where the teens were put in the corner before they were murdered...... well this is how my SFR's looked (well two of them anyway) All the rest of the fish were pretty good and still eating like savages and still growing well. This is when I Decided that there was un-disputably something wrong. 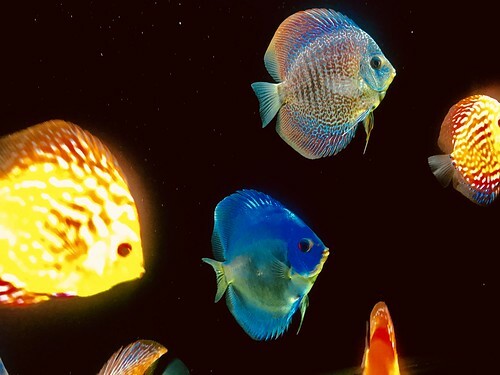 I decided to check all water supplies to my aquarium for ammonia, The mains water, the aged water and the ro water. all these were a deep yellow in colour. This then allowed me to understand that you don't need to find the right light to see the yellow colour you need to see on the api test kit. This means all the problems are caused by a very low level ammonia in the aquarium the last 3 weeks. At the risk of repeating myself I wand to explain how small the colour change was ! it was barley perceptible but this was just enough over a few weeks to put the most sensitive of fish off. The majority of the fish 9 out of the 12 showed absolutely no ill affect from the poor water that I allowed manifest. 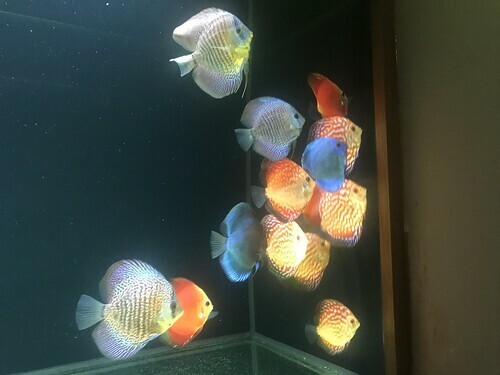 Now back to the feeding, I said earlier that I didn't watch the fish eat, that is only partially true, I feed my fish with food from the fridge and after dropping it into the aquarium i see the discus charge towards the food and eat, this satisfied me they were doing ok, but I didn't stop to really watch rather than return the rest of the food to the fridge. When I did really stop to watch I noted that two or three fish didn't really fight for the food and really only mouthed the food. So lessons learned, and 48 hours now since I completely recovered the parameters of the aquarium and 4 days since I really started making sense of all the pieces of the puzzle to give me a real picture of what happened and the fish are acting normally although a tiny bit pinched in the belly from the two days with only one small feed. So what do I think went wrong........... well this i believe started out with an inflated opinion of what my sump system can handle in the form of food, then the clarisea had gone off angle slightly and allowed solids to remain in the system that should have been taken out by it, trying to push to the edge of what is possible with feed so I could achieve maximum growth and finally having 35 years experience in the fish keeping hobby. 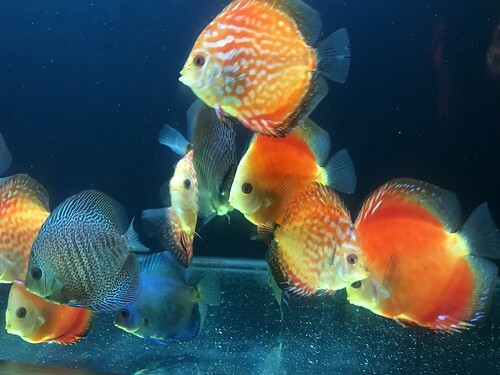 I didn't pay enough attention to the fact that's its my first time keeping discus and that makes me inexperienced in this part of the hobby and I have to be more open to the big picture that's happening around. Last edited by MickO'S; 02-03-2019 at 02:15 PM.